← A New Event from Bellissima Couture is Coming in One Week! 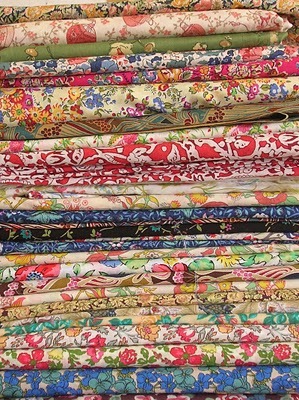 I have had a love affair with Liberty of London fabrics since I was a little girl. My mother treasured her Liberty blouses and scarves, and she passed that love on to me. 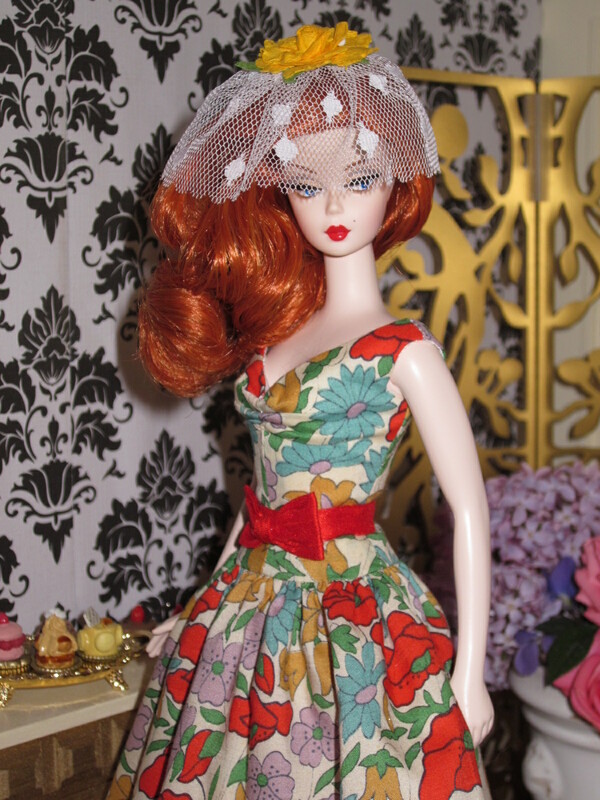 When I started sewing for myself I would save my money to buy Liberty fabrics. It was the most expensive fabric in the shop, and in those days the fabric was only 29 inches wide (as opposed to 45 or even 60 inches wide) and one directional, meaning that it took twice as much fabric to make a garment out of Liberty than a less exulted fabric. But the look and feel of the fabric was unmistakable. 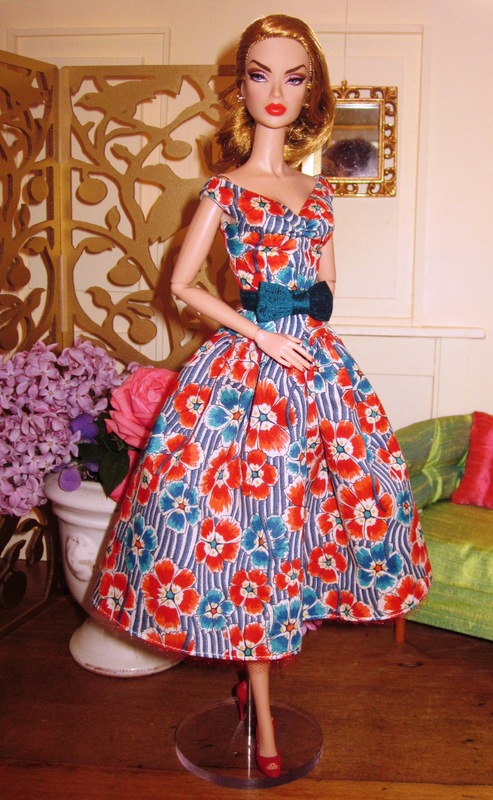 Anyone who knew fashion would recognize a Liberty fabric. It is the best of the best, and has been for over a century. Even Target has recognized the ageless appeal of Liberty, introducing a collection that sold out almost immediately in 2010. While the prints at Target were Liberty, the fabric was not. I can’t describe how delicious real Tana Lawn feels…you will just have to see for yourself. So what is so special about this fabric? What’s it all about? In 1875, draper Arthur Lasenby Liberty opened his first shop on Regent Street. Selling high quality oriental silks, ornaments and objets d’art from the East, it attracted a discerning clientele with a taste for the foreign and the exotic. The artists Ruskin, Rosetti and Whistler were among Liberty’s first customers. Soon the store began to manufacture and print its own fabrics, with designs by artists like William Morris. With their high quality silks and satins and their subtle and artistic colours, Liberty prints were highly regarded as dress fabrics, especially during the years from 1890 to 1920. During the late 19th and early 20th centuries, Liberty had a considerable influence on contemporary trends in style and design, such as the Arts and Crafts movement and Art Nouveau, which was so closely associated with the store that it became known in Italy as “Stile Liberty”. Liberty of London Tana lawn has a tight weave and a high thread count. The fabric gets its name from Lake Tana in the Sudan, where this special hybrid Egyptian cotton is grown. Once the cotton is harvested–by hand–the real magic begins. Using copper rollers, which make it possible to print very fine lines, Liberty of London creates some of the finest cotton fabrics in the world. These prints are each a limited edition and once they are gone that’s it. Liberty comes out with new collections every year. 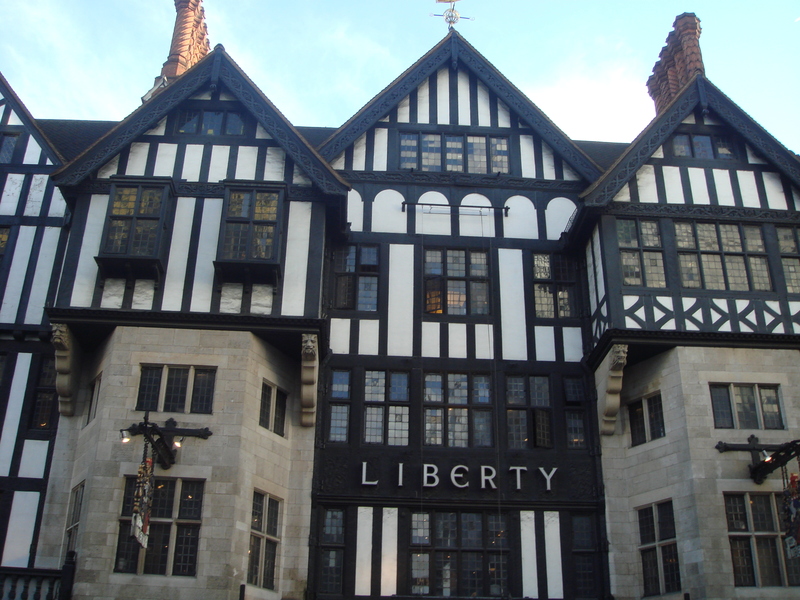 Liberty of London is one of the oldest design houses still designing today. 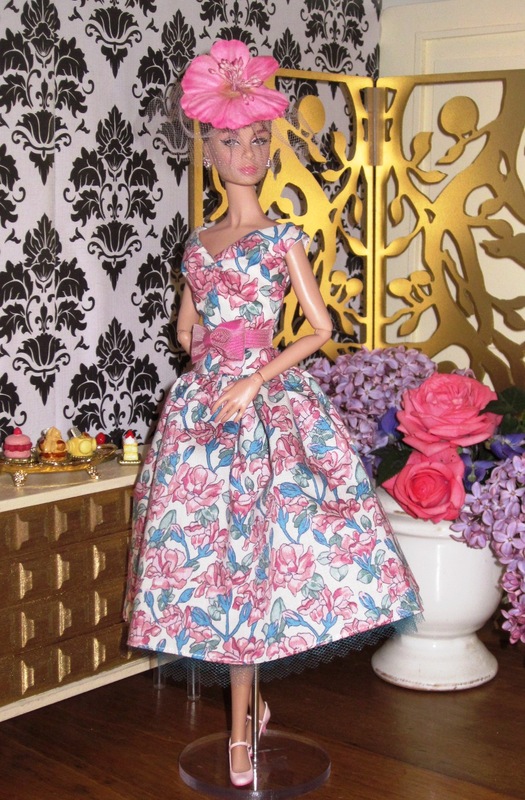 Because of my love of these fabrics, this group of fashions is particularly special to me. 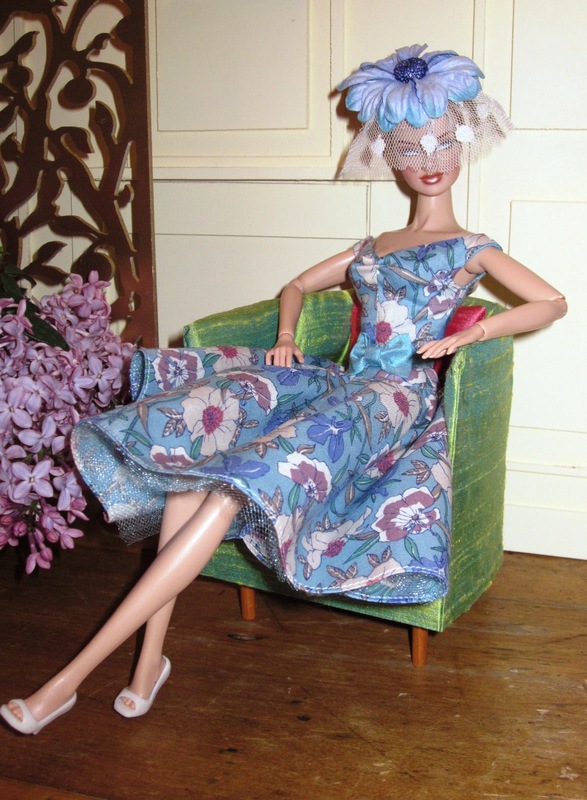 I have had some of these pieces in my fabric collection for more than 20 years. Several of these fashions are pieced together from the smallest scraps of Tana Lawn, many of which are no longer in print. Therefore, only one of each of these fashions is available. Please give your first and second (or even third) choice when emailing to ensure that you get a fashion that you want. Fashions will be sold on a first come, first served basis. 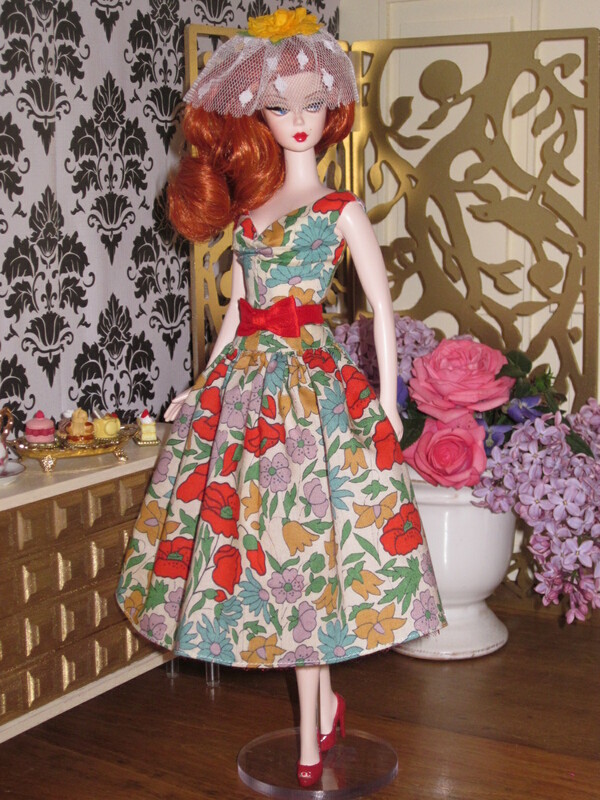 These fashions are fitted to the Silkstone Barbie body, but will also fit other dolls of similar size, as you can see. So Enjoy! Remember, all fashions are limited to one piece only. 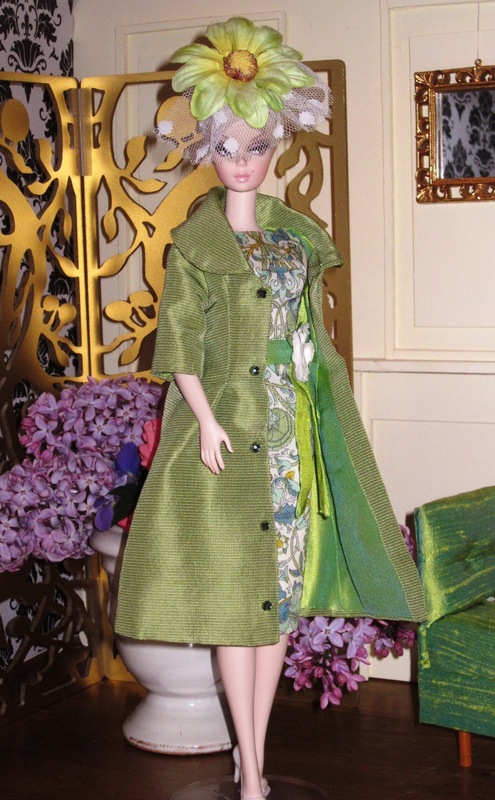 A shawl collared coat in spring green silk twill with faceted green crystal buttons tops this slim sheath in the classic Liberty Art Nouveau print “Lodden.” A spring green sash and creamy gardenia decorate the waist. The fascinator hat is included. This sheath is in a classic Art Nouveau print in shades of pale pink, rose pink, and grey with a rose silk cummerbund. A gorgeous coat in rose pink and grey micro checked silk brocade has tiny faceted silver grey crystal buttons. 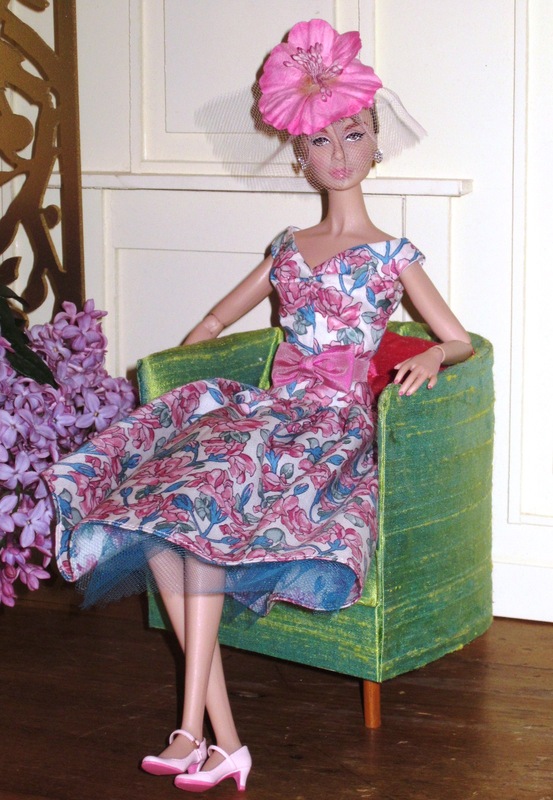 A pink hat swathed in pale pink tulle and trimmed with a pale grey rose tops off the ensemble. I LOVE this fabric, and sadly this is the last of it. I think I only had a fat quarter in the first place. I haven’t been able to find out the name of the fabric, but it is so delicate and beautiful. The sheath is decorated at the waist with an aqua silk taffeta sash and bow. 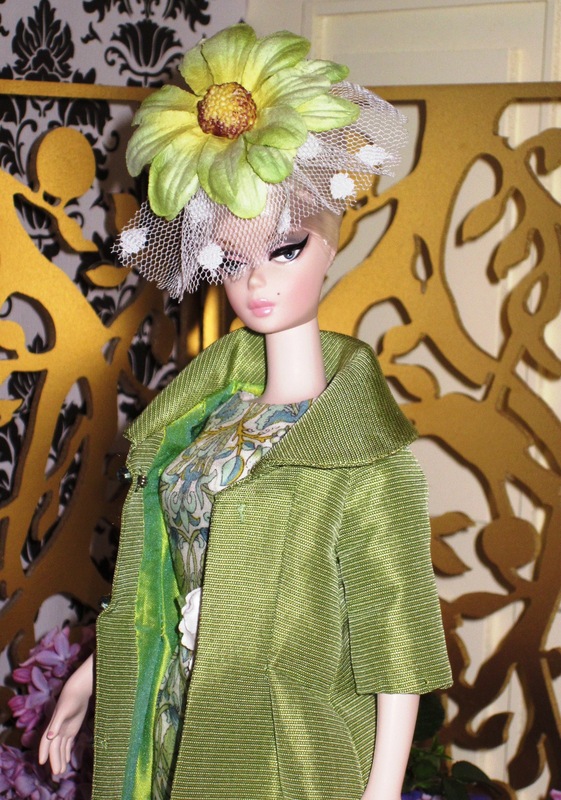 Pale aqua silk noil makes up the jacket, which has covered buttons and a floral lining to match the sheath. This retro floral is part of Liberty’s Spring 2012 collection and was inspired by the film “A Clockwork Orange.” A cropped magenta noil jacket with a round collar has covered buttons and floral lining, matching the sheath. A bright pink silk noil cropped jacket with covered buttons and floral lining, matching the sheath. A vivid green cummerbund gives a pop of color. This print was originally designed by Liberty in 1933 and is one of the most iconic patterns still today. I made this sheath from scraps left over from a sheath dress that I made for myself when I was in my early 20s and living in New York City. So fresh for summer! This navy fabric is scattered with deep red wild roses and leaves in shades of gold, green, and turquoise. A dark red silk cummerbund is the perfect accent. Our house had an incredible garden when I was growing up and one of my very favorite flowers were the miniature carnations known as “Pinks.” That is probably why I love this fabric so much. Covered in pink “Pinks” and their distinctive blue-ish green stems and leaves, it reminds me so much of these spicy fragrant flowers that flourished in my father’s garden. A scalloped tulle petticoat in turquoise blue peeks out from the hem. The pink fascinator is included. 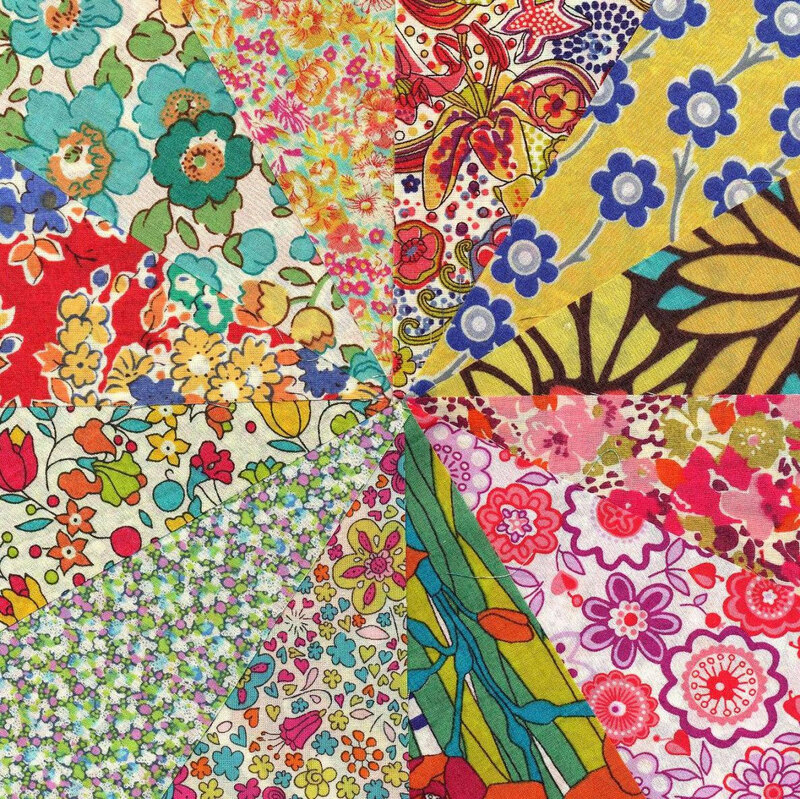 This print was designed for Liberty in 1974 and comes in many color combinations. The bright red poppies are the focal point. A scalloped red tulle underskirt peeks out from the hem. The bright yellow fascinator with white flocked tulle veil is included. 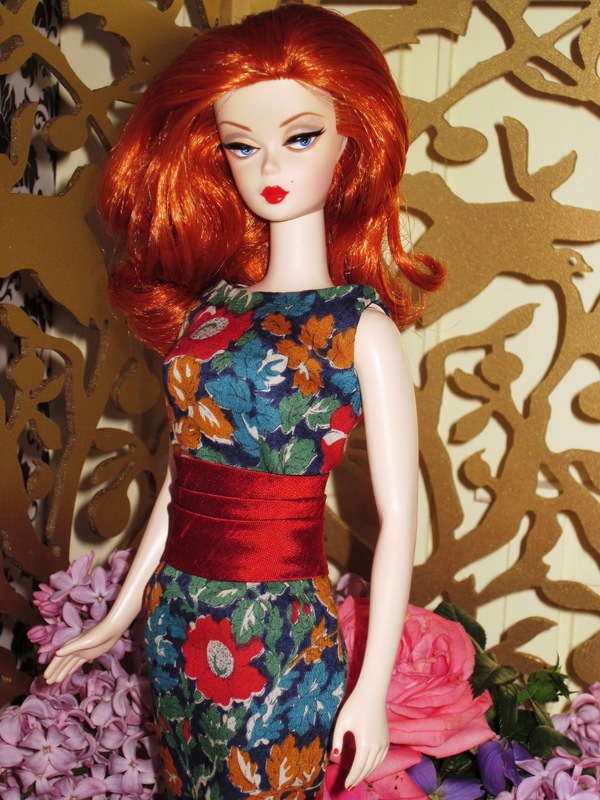 This retro floral dating to 1961 is part of Liberty’s Spring 2012 collection. The colors are so unusual; red, French blue, turquoise and teal. I just love them! I wanted to bring out the teal, so I chose to make the bow and belt in dark teal silk. A red scalloped tulle underskirt peeks out from the hem. This is such a striking color combination for summer! A gorgeous floral in shades of blue and purple, featuring anemones. The blue anemone fascinator is included. I adore this new Liberty fabric, cream decorated with stylized woodblock roses. The tones are subtle, but so enchanting. The scalloped tulle petticoat is in a sparkle cranberry shade, which is also the veil of the fascinator. A single cream rose crowns the ensemble. A cranberry silk belt and bow accents the waist. Thank you so much, my dear! And thanks for the input for this event. I really appreciate it. Beautiful work as always Ms Hilda! I found your blog by the post in the blog Overdresses for life and I really enjoyed visit your blog. You have a beautiful works. I am not a fashion designer, but sometimes I drawing clothes for my paper dolls of my blog. I love the fabric, the sophisticated and chic design of your clothes. Thank you so much! Your work is also beautiful. Thank you for sharing your link. I made paper dolls all the time when I was little and I still have many of them. 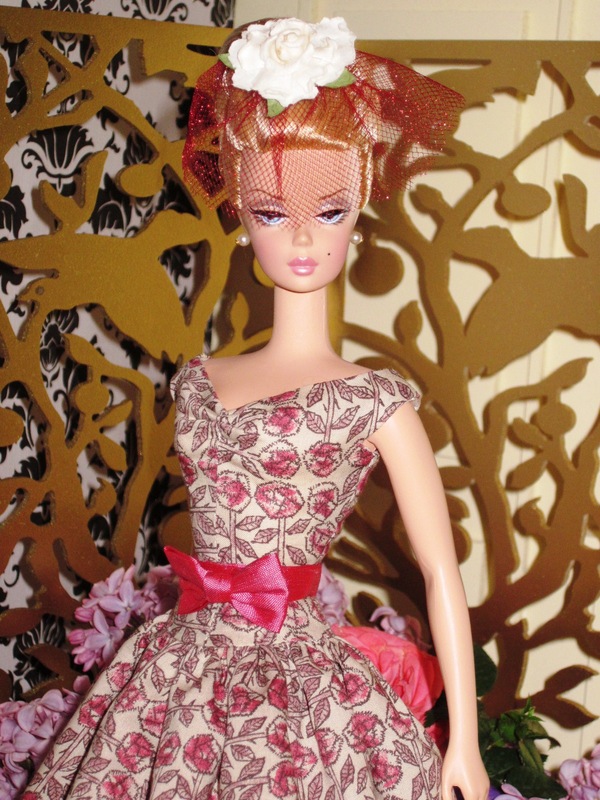 I played with paper dolls more than real dolls, because I loved making the fashions.